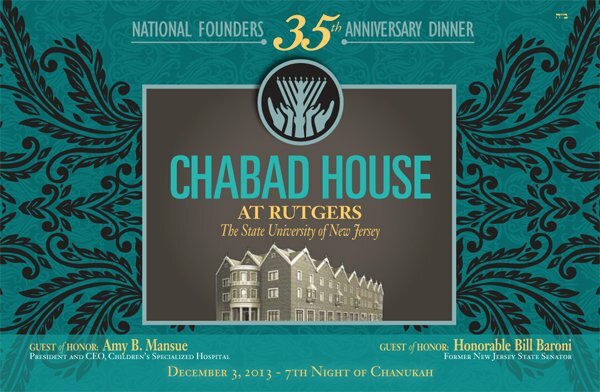 In a spirit of rejoicing and celebration, Chabad House Jewish Student Center at Rutgers University and its ten affiliate Chabad Houses serving central and southern New Jersey, will celebrate their National Founders Dinner at the Grand Ballroom of Chabad House, 170 College Avenue, New Brunswick, NJ, on Tuesday, December 3, 2013 (the seventh night of Chanukah) at 6:00 PM. More than 500 community leaders and supporters are expected to pay tribute to the honorees, Amy B. Mansue, President and CEO, Children’s Specialized Hospital. 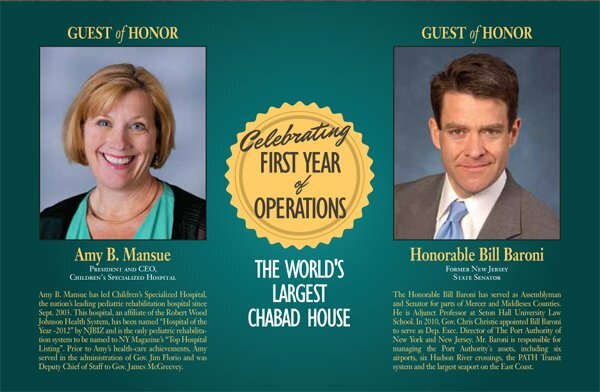 Amy Mansue has become an active supporter of Chabad House, and recently was responsible for creating new partner programs between Chabad House and her renowned Medical Centers. 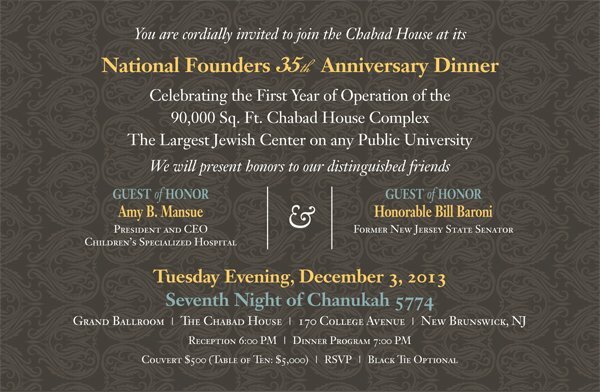 In addition, Chabad House will honor The Honorable Bill Baroni, Deputy Executive Director, of the Port Authority of New York - New Jersey. Mr. Baroni will be honored for his community leadership role in sponsoring community “Menorah” lightings in key areas of the Port Authority of New York-New Jersey. The Dinner Chairpersons are: Judith Burgis, Robert Wood Johnson University Hospital; Doron Cohen, Chairman, Dun & Bradstreet, (Israel) Ltd.; Donald Epstein, CFO, Matrix Companies; Roger Fine, Corporate Vice President, Johnson & Johnson (Ret. ); The Honorable Jim Florio; Isaac S. Gindi, V.P., Century 21 Dept. Stores; Lita Greenberg; David Halpern, Atlantic Realty; Donald Hecht,Partner, Hecht & Co.; Stephen K. Jones, President & CEO Robert Wood Johnson University Hospital & Robert Wood Johnson Health System; Danny Kahane, Developer; Steven Kalafer,Chairman, Flemington Car and Truck Country; Steven Katz, Partner, Sterling Properties Group; Ronald C. Rak, JD, President and CEO, St. Peter's Healthcare System; Richard Saker, CEO and President. Saker Shoprites, Inc.; David Samson, Founding Member, Wolff & Samson PC; Rick Schottenfeld, Chairman, The Schottenfeld Group; Jeffries Shein, J.G.T. Management; Myron “Mike” P. Shevell, Chairman, The Shevell Group; NEMF; Ken Silverman, Chairman, The Silverman Group; Jerold Zaro, ESQ., Sills, Cummis, and Gross. The gala dinner is celebrating the first year of operation of the 90,000 square foot mega Chabad House which features Housing Suites for 107 men and women, a three hundred seat Synagogue, Judaica Library, student lounges, computer areas, and a brand-new 750 person Kosher Dining Hall with new Kitchens. Chabad House is now finishing a new "Sephardic Synagogue” and an International Coffee House to serve all students. All of the above combined creates a unique edifice that proudly serves as the largest Jewish Center on any public university in the world. The dinner will commemorate thirty-five years of educational programs and activities serving the student population at Rutgers University and a unique panoply of educational and social welfare programs throughout central and southern New Jersey. Rabbi Yosef Carlebach, Director of Chabad House, will report on the new complex and its outreach programs and activities this past year. 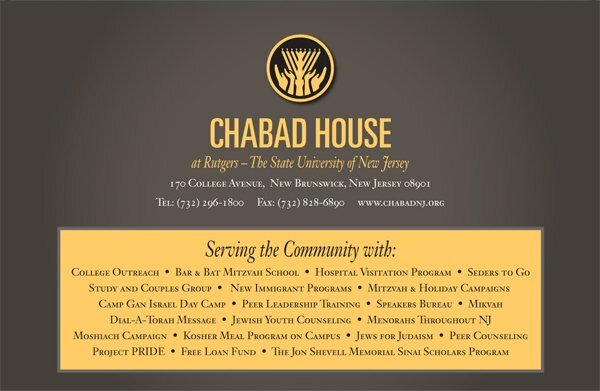 Participants at the dinner will receive a special coffee table Anniversary Album pictorially depicting the history of Chabad House from its first days in a rented room at the Rutgers Student Center to its location today as the largest Jewish Center on any public university campus in the world.